Pollster Ivan Moore released survey results Thursday that show Congressman Don Young is running slightly behind first-time candidate Alyse Galvin. But Young hasn’t lost a race in 45 years, and pollsters have underestimated him before. Even some of Galvin’s supporters are keeping their hopes in check. Campaign volunteer Sara Dykstra is good at getting strangers to open their door. But on an icy night in Fairview, one undecided voter was reluctant. Dykstra held up her Alyse Galvin campaign literature. “She’s running for Congress against Don Young,” Dykstra shouted, to be heard through the closed window. And that seemed to do the trick: The door opened. It probably helps Dykstra’s success rate that she often brings her toddler, and that she’s hugely pregnant. She’s due to deliver next week, the day after Election Day. “Hi – so have you heard of Alyse Galvin running for Congress?” Dykstra said. Dykstra ran through Galvin’s attributes: She’s a lifelong Alaskan, an independent and the Democratic nominee. Dykstra told her Galvin wants everyone to have affordable health care. “Yeah, but who pays for it?” the woman said. Dykstra kept the woman talking for over five minutes. Galvin volunteers are also hitting the phones. 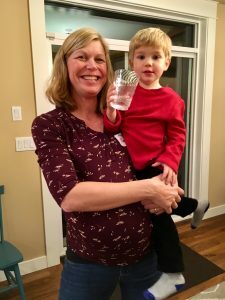 At her threadbare campaign headquarters in Spenard one night this week, every surface had been put to use as a makeshift desk and someone was sitting at it, making calls. People were working at tables even in the garage. But away from the din, retired electrician Bill Sosnowski had the laundry room all to himself. He dialed a voter in Tok and asked if he’d support Galvin to unseat Young. That’s part of the challenge for Galvin supporters – fighting the sense that Young’s re-election is inevitable. Those who don’t like Young have had their hopes dashed 23 elections in a row. Don Young ads are in heavy rotation on television. He’s on radio, and in Anchorage his advertising is mounted on the back of public buses. But Young’s ground game is less visible than Galvin’s, at least in Alaska’s largest city. His campaign repeatedly told me there were no events to watch in Anchorage this week, with Young or with volunteers, though a spokeswoman said there will be a rally with Mike Dunleavy, the Republican candidate for governor, on Sunday, and that sign-waving will also kick off next week. Young’s long-time campaign manager Jerry Hood says the focus now is on getting out the vote. But in the final full week before the election, while Galvin headquarters was abuzz in the evening, Young’s campaign office was dark during some prime calling hours, with nary a car in the parking area. Hood said it won’t remain that way. Phone-banking “will happen at the campaign office, when it occurs,” he said. Hood said he thinks when Alaskans get in the voting booths on Tuesday, they’ll again select Young, as they have since 1973. Hood pointed out the congressman is still getting bills passed – four in the current two-year Congress. “I think Alaskans know that, and they won’t jeopardize their future by electing a naive rookie with no experience,” Hood said. Political science research shows persuasion campaigns aren’t all that effective, not if they run counter to a voter’s partisan lean. But identifying supporters and urging them to the polls – that’s been proven to work. And as the Galvin supporters see it, the 24th time might just be the charm.